Our product range includes a wide range of sealing machine belts, packing machine timing belt and packing machine conveyor belt. Backed with a vast infrastructure, we offer an exclusive assortment of Teflon Belts. The material used in manufacturing these belts is PTFE coated fibre glass, which is checked on various quality parameters. 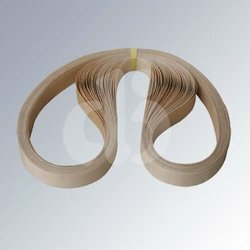 Features Durable Reliable Affordable We are the leading manufacturer and supplier of a wide range of Ceiling Machine Belts in Coimbatore, Chennai, Tirupur, Pollachi, Trichy, Salem, Erode,Ooty, Madurai, Tirunelveli, Hosur, Krishanagiri, Vellore, Karur, Dharmapuri, Dindigul, Kanchipuram, Perambalur, Thoothukudi, Kozhikode, Kannur, Cochin, Allepy, Thiruvananthapuram, Ernakulam, Idukki, Malabar, Thrissur, Palakkad, Kottaiyam, Chittoor, Visakhapatnam, Hyderabad, Tirupati, Bangalore, Mysore, Tamilnadu, Kerala, Karnataka, and India.